In the last segment we covered に, which guides indirect objects towards verbs and indicates some kind of directionality. In this portion we’re going to look at the last two remaining major Japanese particles (though there are plenty of others), を (pronounced “oh” as in “oh no, not more particles that sound different) and で (read the same as “day” as in what makes up weeks). Whereas indirect objects are the territory of に, direct objects are the land of を. Basically, when most nouns get partnered up with a verb, you’re going to need one of these guys. And most verbs will need を (see the previous article for some examples of when you should use に instead). This can be a bit unusual at first since it isn’t something we really do in English. For example, playing tennis. Your noun’s going to be “tennis” and your verb will be “play” or in this case “to do.” While we just say “play tennis” in English, in Japanese it looks like this: tennis を play. This coupled with は from the first segment of this series makes for one of the most common basic sentence patterns: topic は thing を do. The final particle I’m going to talk much about in this series is で, and it rounds out your fundamental color wheel of Japanese particles: は, に, を, and で (with cameo appearances from が and へ). で has 2 key jobs: 1) indicate where something is taking place, and 2) indicate the means by which something occurs. To give you a little clearer idea of that second one, here’s an example: chopsticks で eat. Everyone I’ve known that used manga to study Japanese and been successful has that one series that propelled them forward with the atmosphere-transcending boost of rocket fuel, for me it was a series with the English title of High School Exciting Story: TOUGH (though its Japanese title is something closer to High School Iron Fist Legend Tough). It’s the story of Kiibo, living in Osaka, who was born into a family that is the last bastion of a legendary, lethal martial arts style. The art style features a high degree of realism (though some supernatural/spiritual elements come into play later in the series) and the storytelling is largely episodic, culminating in a massive martial arts tournament—if you like mixed-martial arts or fighting games (a la Street Fighter) this’ll probably appeal to you. As a comic intended for an adult audience, Tough is not an easy read, using complex fight, physiological, and religious terminology, including some kanji you are unlikely to see anywhere else unless you get heavy into kanji study or Buddhism. But it hooked me. Finding the series that appeals to you personally is more important than anything. I spent over 10 minutes working my way through certain pages at times because I was nowhere near the understanding for the Japanese ability I needed, but I loved it, so it didn’t matter—also I didn’t have to buy new volumes as often. The series as a whole has 83 volumes (there’s a follow-up and short spin-off series). By the end I was reading through 3 volumes a day; each of which was around 180 to 230 pages, I believe (I honestly don’t remember that precisely). Anyway, I’ve gone on long enough about this, but my point is, if you can find something you like—even if it seems beyond your level—I recommend you go nuts. Here it’s pretty easy to understand how を marks the direct object of a sentence, and see how that contrasts with other particles. The meaning of this sentence is “[You’ll] kill me?” But if instead you used は (wa) from the first article in this series, then you’d get “I’ll kill [it].” And some of the other particles we’ve looked at before would lead to eyebrows raised in confusion. 勝負(しょうぶ)は一瞬(いっしゅん)で決(き)まっ た Fight は instant で decided. ワシの肉体(にくたい)の中(なか)でアドレナリンが歌(うた)い踊(おど)りだしてきたわっ。 The inside of my body で adrenaline が singing and dancing. 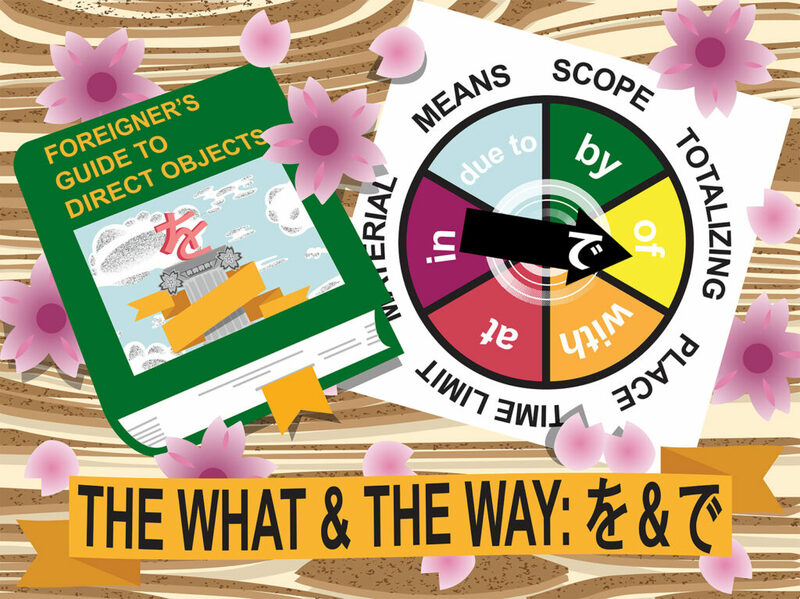 Japanese sentence order in terms of the subject, indirect object, direct object, verb, etc., tends to follow a certain pattern; however, it’s not without some flexibility. In this sentence, the location comes before the main subject. It could just as easily come after, but by putting it first, the sentence feels different; a little emphasis is added to that part of the sentence. Practice and regular reading will gradually inform your sense of taste for the different flavors of sentences, and what effects you can achieve with some creative word re-ordering. Now see if you can guess the approximate meaning of the sentence above based on the English clues and the particles. Seriously, give it a shot. If you were in the neighborhood of “the adrenaline in my body is flowing,” then congrats! If not, then maybe take a look at the earlier entries and just make some quick review notes on the general functions of each of the particles that have been covered up to this point. 王(おう)の闘(たたか)い方(かた)をどう思(おも)う？ King’s fighting style を how do you think? Try to abstract your thinking from just the English and focus on what function を is serving. Taking time to ponder over each new or unusual usage of a particle that you encounter will give you a deeper understanding than reading a grammar book will. For this set of exercises we’re changing it up a bit. For each of the following sentences determine if the blanks should be filled with an を or a で. The first two questions should be fairly straightforward; を is used when linking an object to a verb, and で is used when indicating a place of action. #3 reminds us that で is also used when indicating the means by which something is achieved, whether those means are concrete like a fork for eating pasta or steel beams to build a tower, or those means are figurative or an idea like someone’s sound reasoning or a mathematical theorem. #4 is pretty typical again, but the common order of place then thing then verb has been reordered a little to put the object that the verb applies to (in this case “fish”) ahead of the location (“sea”). Notice that when these sentences are rendered in English the place usually comes last—as you can see in #2, where despite the place getting first mention in Japanese it feels natural coming later in English (arguably you could go with “At college, I studied English” if you wanted, but that’s somewhat beside the point). And the last question is perhaps a bit unusual. We don’t (or at least I don’t) usually think of being alone as the way in which something occurs, but in this case it is descriptive of the subject’s whole life. There are a number of these oddities that you’ll stumble across in your studies; they’re not really exceptions so much as they expand the way you think about the applications of the particle and what it can mean. Discovering the limits of the tools of Japanese is what allows us to find our own creative boundaries in the language—as you encounter them, I invite you to play with them a little.